This week’s music artist, we think, is barely recognisable from her old self as she has stripped back to basics. Quite literally. The mystical Natasha Kahn behind Bat for Lashes is no longer hiding behind the spiritual gimmicks and glitter, and has bared all on the front cover of her third album The Haunted Man, released this week. As much as we loved her old hippy self in Fur and Gold (2006) and Two Suns (2009); this raw image is almost symbolic of the steps that she has taken forward in becoming more herself – honest and simplified. Natasha sings uncomplicated melodies and can play an array of instruments from the piano to the autoharp! She is a talented bean. The Haunted Man is both audibly and visually more stream-line but her allure and magic has not been lost. This album has everything. Lilies is a pleasant opening song, The Haunted Man is a sincere mantra of the past; we feel loneliness in Winter Fields and heartache in All Your Gold. 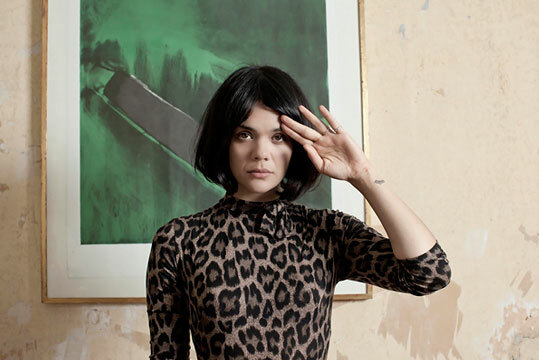 Watch Bat for Lashes’ minimal-style video for All Your Gold. You can purchase the album from iTunes and you can catch her singing live next on October 18 at Ironworks, Inverness UK.